Those who used to workout but like to ReBoot themselves back into it! 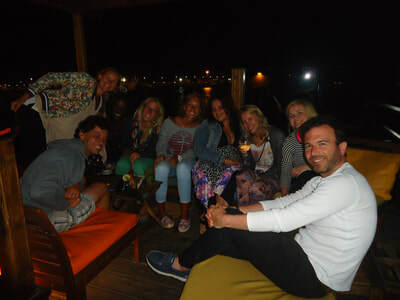 Those who like an active and yet very relaxing holiday. Those who aren't necessarily interested in Watersport but do like an active twist to their holiday. Those who like to workout before or after their (wind)surf session and need some guidance. Those who like to learn better ways to train and calm their minds. Those who might like to add a bit of sport to their winter sun beach holiday, right after christmas, making it a fresh start of the New year. Those who like to put action to their intentions of better health and more exercise. It is for everybody who likes to give themselves a bit of attention.. Your Accommodation, standard packages have shared rooms. Ask for a private and/or breakfast if you prefer, be in time as private rooms run out fast. 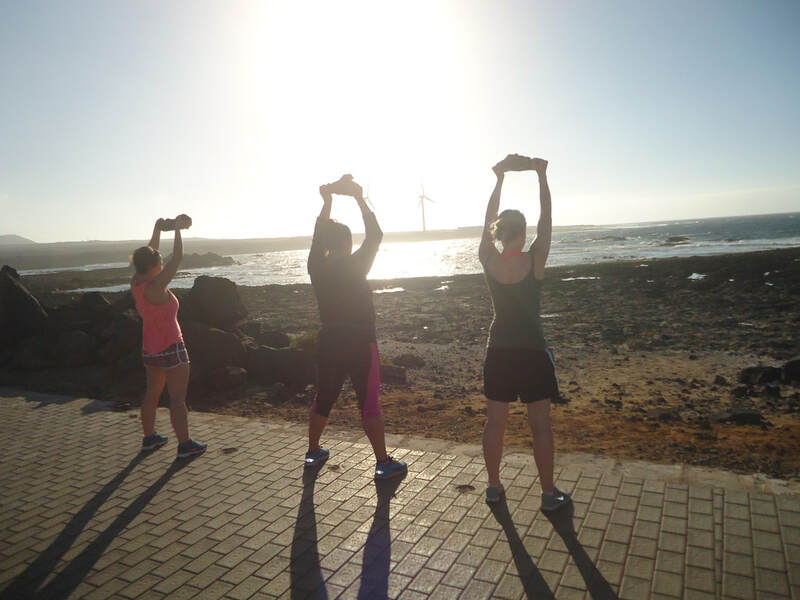 Daily Workouts - Functional Training, Bootcamp & Circuit training; Outside on the beach, in the park, aside the ocean on the boulevard... Fresh air, a bit of sunshine and an ocean breeze are the best conditions to work yourself into sweat. This can be 5 sessions of an hour, or 4 session of each 90 minutes, depending your package and time of the year. Daily Yoga - To keep your muscles lean, and your mind at ease. 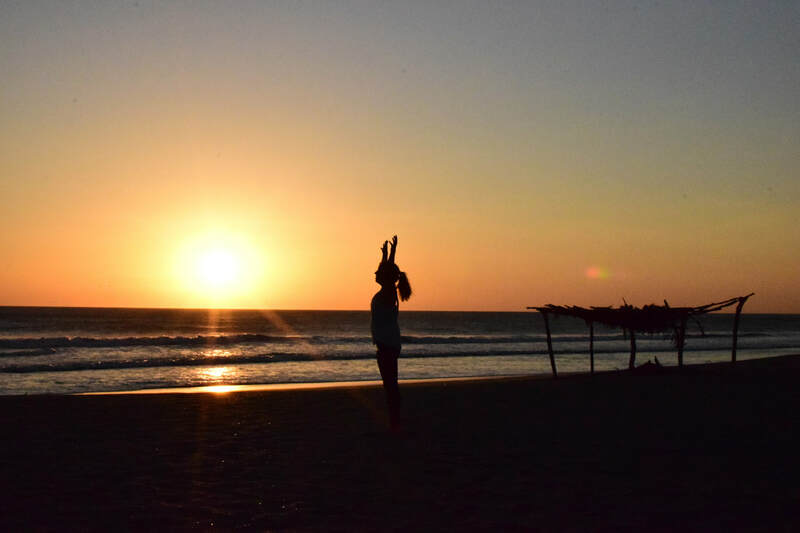 Morning or Sunset Yoga sessions which relax the sore muscle and calm the mind. 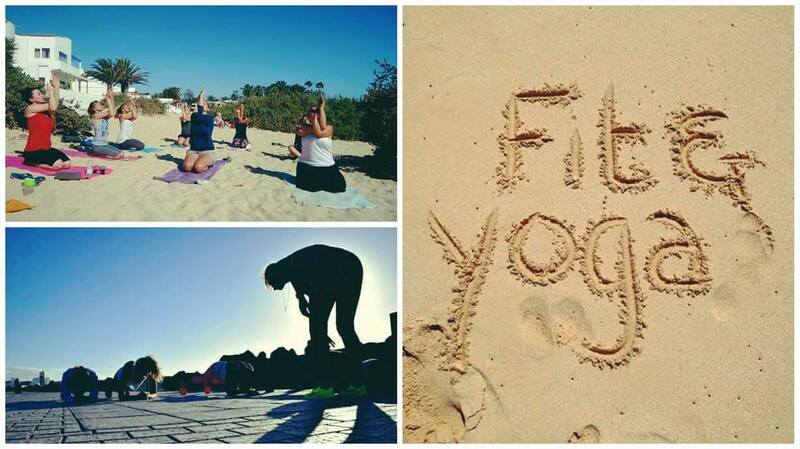 A yoga session takes 90 minutes on the beach or the roofterrace. An intake & evaluation session with your personal trainer. Dietary & Health Guidelines for you. ​Working-out only works well with the knowledge of what you take in and how you act! You are what you eat! You become what you think! Prevention Course in German Those who live /work in Germany can now also apply for the Prevention Course, this way you have the right on a coverage from your health insurance (if you haven't used it yet), to take with our Functional Training program and licensed trainer! * for more info see the price & package list or Contact us straight away. Massage; Ayurveda / Sports / Relaxing massages are addable to your package, spoil your yourself with a full body treatment. Volcanic Hike; Want to see the island from above? Explore the crater and work on your perseverance, Join Anne in Volcano Hike. Airport transfers; To take a way the hassle of the bus we add for you the airport transfer. This is an optional feature to keep the basic price as low as possible! we pick you up in the arrival hall, and make sure you'll be back in time after your week of fun finished. Stress & Hassle Free. Personal Training; Want to have a bit more personal attention, go deeper into your possibilities, this is your chance; Book personal training with Kathrin, aside the group workouts. Vegan Cooking workshop; Interested in learning more on plant based cooking? How do you maintain a healthy and sufficient intake of food, vitamins, minerals and proteins while cutting out some very standard products? It's easier than it looks like, discover it with this cooking workshop including a meal! (lunch or dinner). This guy is AMAZING! Nothing but good and loving feedback comes back after working-out with him. Yan is a physiotherapist, German and loves surfing, since he came on a holiday many years ago he always wanted to come back, now he's here for a while, enjoying the goodlife working as a receptionist. He will make the perfect workout, keeping in mind your experience, wishes, level and health! No more reasons to doubt, Stop Wishing, Start Doing! Kathrin's life is all about movement, sport, health and fun! This beautiful blondy studied her bachelor in Sport Science and finished with a Master in Prevention and Health Management. Training with Kathrin is not only well thought through its also fun! 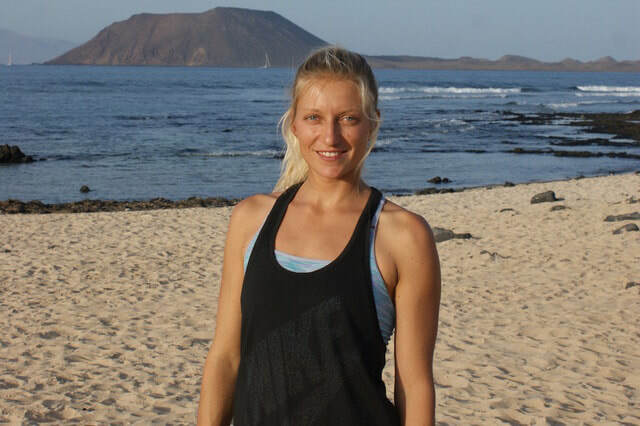 Kathrins passion for surfing is what drives her every day to find waves and live the goodlife! A perfect match in our FV-team! What does a Week of Fit&Yoga looks like? Relax you are finally HERE! Day 1; Wake up, not to early, just in time to take a refreshing shower, cup of tea and a snack. We will pick you up at the house and walk together to the spot. 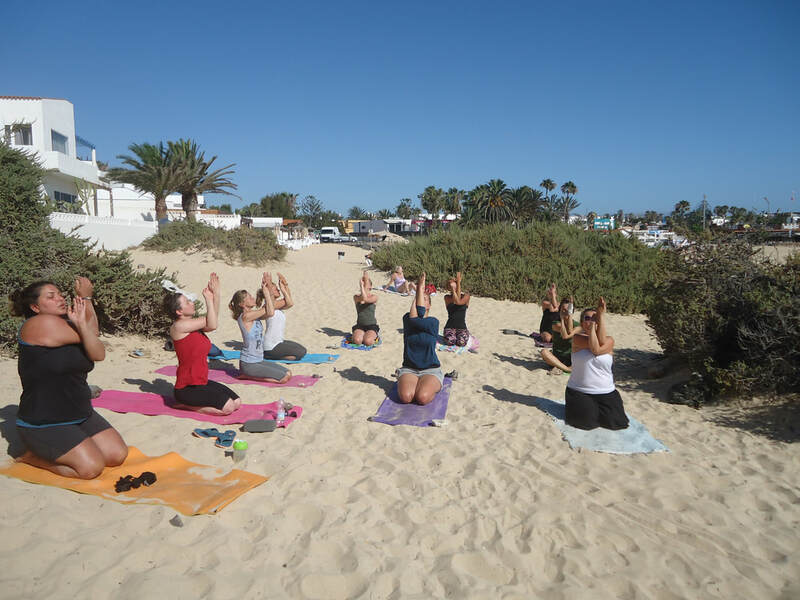 After your session its Me-Time, do what you want :) Time for a long breakfast, lunch on the beach, smoothies and sunbathing..
- Around 18.00h is the second session of the day; Yoga or Workout we meet on the beach and walk together to the spot. After this session,you can pick a place for your dinner, or cook at home with some new made friends... The night is yours..
Today same time you have Yoga or Bootcamp, we meet at the same place as where you left yesterday. Just before the sun sets it time for the second session of the day. ​We meet at the place discussed and will take our time to wind down, or give it all we got. Today its time to sleep in! Maybe take a tour to Lobos island, or rent a car drive around. It's a good day to go surfing or windsurfing... 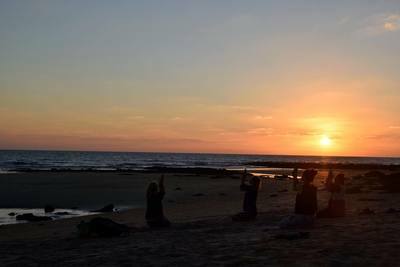 It is up to you..
At 18.00h there will be Yoga, that's all for today..
After yesterdays sleep-in, today your energy levels are up and running! Time for a morning workout, fresh air, early sunrays running passed the harbour..
After your workout you're off for the rest of the day. Maybe this is a good day for a massage, or that SUPYOGA class if the wind is low..
Tonight if you like it, you can join the dinner! Lets try to meet around 19.00h, it will be a nice evening and maybe we even take a drink in Banana!! 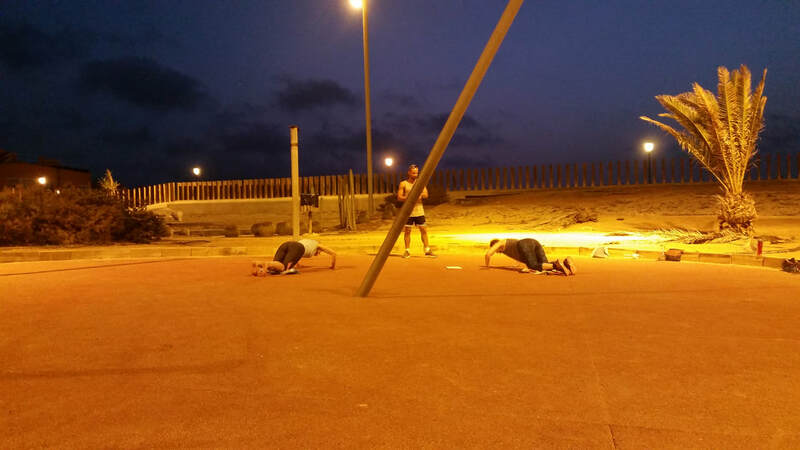 ​Like nothing happened, but with a fun and warm group of people, we will do our last bootcamp of the week... 10.00h is early enough after yesterdays night out. Time to pack and go... With a practice to follow at home and some new good friends in your heart... See you next time! Every week can be a little different of course, but it will be a lot like the above setting. 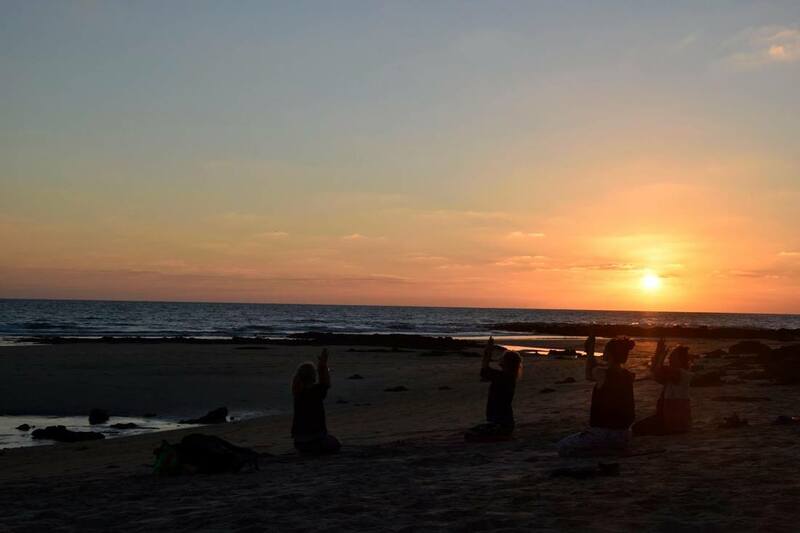 From 11 till 18 May & 1 till 8 September in Lajares we have the special Fit and Yoga health week Retreat. One week, complete Retreat, in a beautifull villa with heated pool just aside the volcanos. Want to know more or reserve your spot (be quick only 8 spots per Week available)? Send us the form below with your questions!